·Power source of hydraulic tools, such as the power unit of bolt tensioner. ·Performance test and calibration of instruments. ·Static and dynamic test for aero components. ·Inject chemical reagent into piping or reactor. 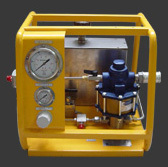 ·Pressure test on valves, piping, end fittings and pressure vessels, etc. ·Various kinds of automobile pressure components, such as brake pump, water pump, cylinder body and pump casing, etc. ·Suitable for the static hydraulic pressure test and leak test, such as compressor housing, heat exchanger, heat interchanger, hydraulic hose/engineering parts and so on. ·Compact design and convenient shift, easy operation and simple maintenance. ·Wide range of high pressure output from 5Mpa to 740Mpa, output pressure can be adjusted freely. 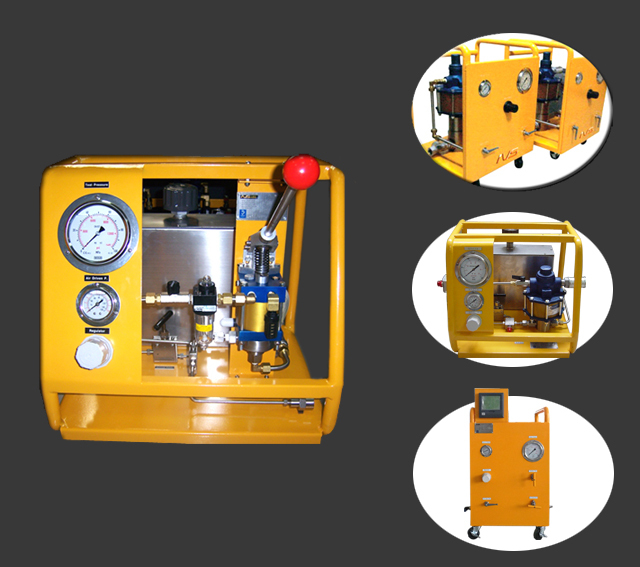 ·Unique manual control pressurizing device provides, actually, two operation modes--Auto + Manual operation. With the help of a handle installed on the pump you could still generate a high pressure up to 100Mpa even in the absence of compressed air. ·All high pressure tubing, valves and pump are made of stainless steel. ·Water, oil, emulsion or other liquid medium are applicable.